In given example we will show that how to uploads file along with other data in single call. This project is in MVC, so first of all you have to create a MVC project. 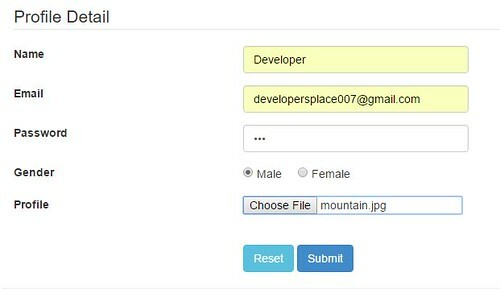 Here are some steps to create MVC project to send data to controller using jQuery AJAX call. Create MVC project and write following code in to Index.cshtml page. <input type="text" class="form-control" id="name" name="name" required="" maxlength="50"
<input type="email" class="form-control" id="email" name="email" required=""
Create controller to which we are sending our data, it could be anything like image or text. 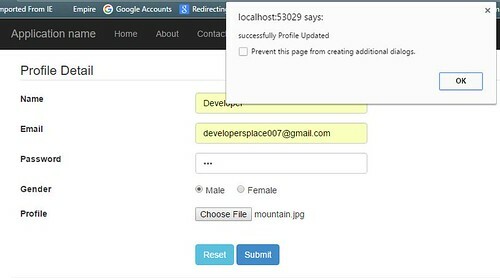 Here before action we have written HttpPost because we send data through post method in AJAX call. Create an AJAX call as given below and main thing is in our AJAX call is FormData. It is useful to transfer data from AJAX call to our controller. This code is written in "Script.js" in "/Scripts" Folder. To use this code we have to include it in to "_Layout.cshtml" after all other script. We can also include it in "BundleConfig.cs". After fillup the form click on submit button. And use debugger in c# code to view the details. Here as we can see that our all the data is available in "userDetail" object. Now we can use this object to insert data in to database also. After data reached here it will show you successfull Message. This project main focus is to bring data and file in single call and store it in to Database. Here I have not included the CRUD Operation. Oops - sorry. Clicked on that 'post comment' couple of times. Did not see it appearing above.